Chun Soo-Ro (Ko Hyun-Jung) is a woman that is plagued by panic disorders. In the past, she relied on her sister to help her, but her sister is now about to leave the country. At the Busan port terminal, where her sister just departed, Chun Soo-Ro suddenly suffers another panic attack. At this time, a nun approaches Chun Soo-Ro and helps her take her medication. Later, the nun asks Chun-Soo-Ro to deliver flowers and a cake to a man that the nun confesses she loves. Chun Soo-Ro agrees to make the delivery and goes to the hotel room where the man is staying. Nobody answers the door, but the hotel room door is unlocked and slightly ajar. Chun Soo-Ro then walks into the hotel room to drop off the delivery. She becomes shocked when she sees a man, stabbed to death in a chair. Three other men then enter the hotel room. Chun Soo-Ro is able to hide when the men enter the room and then make a quick escape. Unbeknownst to Chun Soo-Ro, she is now wanted by the cops and two groups of menacing gangs. The cops want Chun Soo-Ro as they believe she is part of a drug dealing operation and the two gangs want Chun Soo-Ro to get back the drugs that was supposed to be delivered in the cake box. Filming began May 17, 2011. Movie is set in Busan, South Korea. August 12, 2011 - filming for "Miss Conspirator" was halted due to poor health experienced by director Jung Bum-Sik. Filming began three months ago with approximately 35% of the shooting completed. A search for a replacement director is now being conducted. 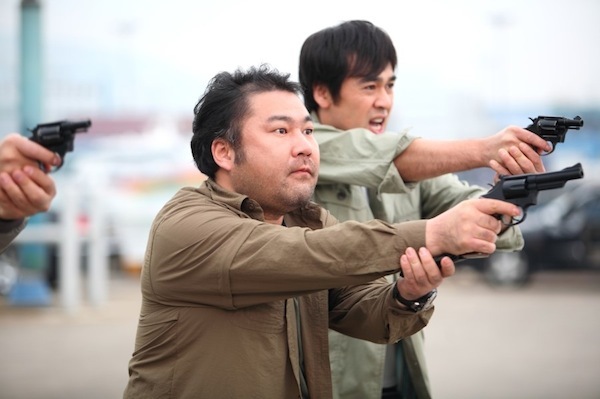 September 22, 2011 - actors Choi Min-Sik and Kim Tae-Woo dropped out filming for "Miss Conspirator" due to filming delays. September 27, 2011 - actors Lee Moon-Sik and Park Shin-Yang took over roles vacated by Choi Min-Sik and Kim Tae-Woo. Filming finished December 15, 2011. The last scened filmed took place at warehouse in Taean County, South Korea. The scene involved a fight between Yu Hae-Jin and Lee Moon-Sik. Sabah Jul 03 2012 7:57 pm In the third trailer, the one that lasts 0:55 s, what is the song or piece of music that begins at 0:14 s? I have asked so many people, I just can't seem to find out. I would be very grateful if anyone could help me. Thank you. monmon May 10 2012 6:32 pm im so excited about it!!! !...Ko Hyun Jung is really a brilliant actress!! !love her so much!!! riachann Mar 24 2012 12:04 am can't wait for watching this. >_< i love ko hyun jug. ft Feb 23 2012 1:22 am hurry...my kohyunjung ...im waithing for u forever....irealy wamt to watch this movie..oh when this movie???? ?